So I started rummaging through the tomes lying on my bed to select one that would have minimum ingredients. I realised that I have not made Ciabatta till now, so bread for the day will be just that. How many additions can ciabatta have? 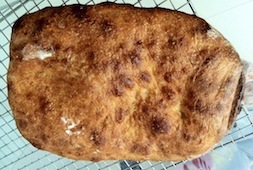 I short listed Jason's ciabatta from TFL, PR's ciabatta with poolish, JH's ciabatta with biga & Jim Lahey's ciabatta. But then I saw JH's Ciabatta with olive oil and toasted wheatgerm. Great! Just two more additions should keep me happy and not come to hubby's notice. JH's recipe uses poolish. I had ripe levain of almost same quantity that of poolish. Both had equal hydration, so I decided to use levain in place of poolish. I kept the rest same as per recipe, but mixed by hand. I was not very happy with the hydration of the dough. So I went ahead and increased from 72% to around 85%. Once it became a gloopy mess, I was satisfied. Did 3 s&f in first 30 minutes and refrigerated the dough for overnight bulk ferment. Today morning allowed it to come to room temp & rise fully. It took just about 1 hour (tropics!). Quickly shaped the best as I could, put on parchment paper & covered with tea towel. The second proof was around 30 minutes. Baked at 460F on pizza stone for first 20 minutes, using foil container to cover (thanks to Floyd's tip) and then uncoverd it & baked for another 20 minutes at 440F. at 85% hydration is much like herding cats. I just kind of fold it over on itself like a letter fold and then roll / flip it over sort of seam side down with another fold :-). I think yours came out very nice with a nicely browned crust, I always prefer brown to pale, and the crumb is very open. H to be tasty. Tks DA & Ian. The moment I put the dough on the parchment paper I realised I had skipped folding & flipping over. I was scared to go back or work it further for the fear of degassing the dough. In hindsight, I was treating the dough too delicately as it was my first time with ciabatta. After looking at the gorgeous photos of Ian's ciabatta, I feel I could have been more generous with flour & less hesitant in handling the dough. Will try the rye spelt flour one next, but probably with garlic instead of onions. Sounds like a good combo. Sounds like a good combo. Let us know how it turns out and don't be afraid to use a lot of flour when shaping. It's the only time I really use flour at all unless I'm making baguettes. I too have had some ciabatta come out looking like toasted mini-surfboards (too spread out and not a lot of height). I have found that mixing the dough more helped. I use a poolish and overall hydration is close to 75%. Plus stretch and fold 2 times in a 3 hour bulk fermentation and then business-fold each for the final rise. Use lots of flour in my couche to help from sticking and also for aesthetic effects.